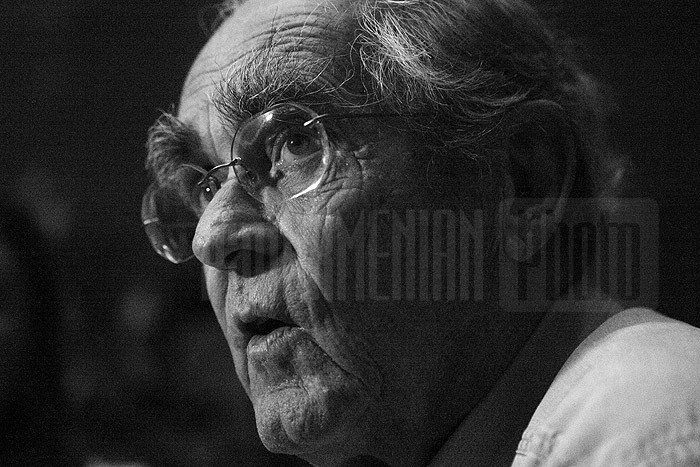 Today I was lucky to be present at Michel Legrand's concert at Aram Khachaturyan hall in Yerevan. I went there spontaneously, without planning, as my friend called me only an hour before the concert, telling that she's got an extra ticket. I bless that very moment for the excitement and feelings I'm having now. I was occasionally thinking about some of my friends and my mother who I wished were there enjoying it as much as I was doing. There were really very very smooth transitions from fugue to light jazz and I loved the harp! Some of the songs were performed by Christiane Legrand, Michel's sister. God, she had a powerful voice! Everything about that concert was perfect. The hall was more than full, the audience was smart and conscious. When the concert was about to start, a perfect couple came and sat near me on the row. Michel Legrand (born February 24, 1932 in Paris) is a French musical composer, arranger, conductor, and pianist of French and Armenian descent. Legrand has composed more than two hundred film and television scores and several musicals and has made well over a hundred albums. He has won three Oscars (out of 13 nominations) and five Grammys and has been nominated for an Emmy. He was twenty-two when his first album, I Love Paris, became one of the best-selling instrumental albums ever released. He is a virtuoso jazz and classical pianist and an accomplished arranger and conductor who performs with orchestras all over the world. Legrand is known principally as a composer of innovative music for films, composing film scores (about two hundred to date) for directors Jean-Luc Godard, Richard Brooks, Claude Lelouch, Clint Eastwood, Robert Altman, and many others.